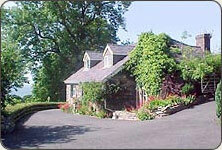 The cottages at Cil-Coed Uchaf (meaning "hidden in the trees") are situated in a peaceful and tranquil location. Nestled amidst large, old trees and overlooking Caernarfon Bay in an area of natural, outstanding beauty, the cottages boast some 33 acres of fields and hills in which to roam. Parents can relax whilst their children play in the nearby fields in complete safety. Breathtakingly beautiful sunsets can be viewed from the cottages, and on a fine Summers' evening the mountains of Ireland can be seen. All of our holiday cottages have excellent sea and countryside views, and the nearest beach is approximately 20 minutes' walk away, or 3 minutes by car. 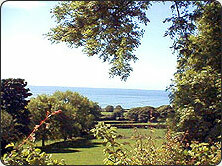 The cottages are ideal for families and couples alike. 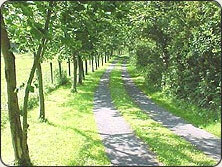 After a day out visiting some of the many attractions in the area, why not take a short 15 minute stroll down our tree-lined drive and along a country lane down to the village. Here you will find a very old, magnificent church which is well worth a visit - it is one of the finest churches in Wales, and is celebrated as containing the burial place of Saint Bueno. There is also a village store and a Post Office. The village of Clynnog Fawr is situated on the A499 coastal road between the Royal town of Caernarfon and the market town of Pwllheli (with its excellent new marina). Please see our Directions Page for more information about how to find us. Cil-Coed Uchaf is an ideal touring base for Mount Snowdon, Anglesey, the Lleyn Peninsula, Portmeirion, Betws-y-Coed, Portmadog, Llandudno and North Wales. We are open all year, and short breaks are available. Please contact Marie to find out more or to request a copy of our full-colour brochure.